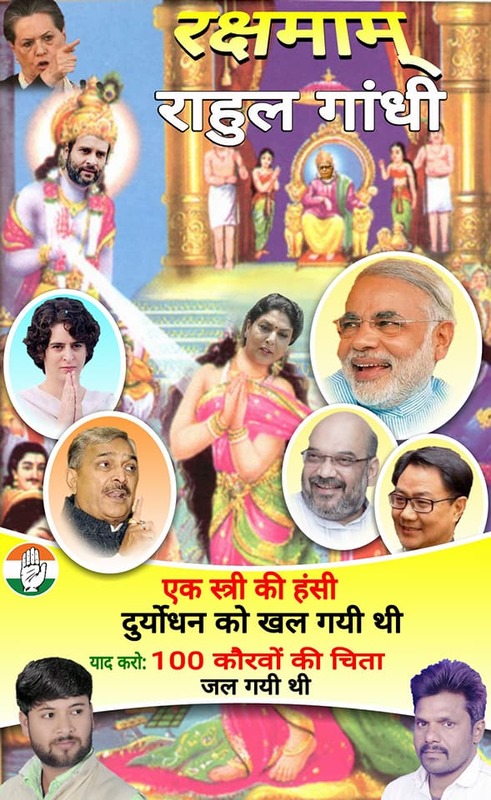 A local Youth Congress leader from Allahabad has created a controversy by posting an image on Facebook that depicted Rahul Gandhi as Shri Krishna protecting Renuka Chowdhury’s honour and BJP leaders including the Prime Minister as Kauravas as a recreation of the famous episode from the Mahabharata when the Kauravas attempted to disrobe Draupadi. The Congress chose to feign ignorance about the poster and the BJP described it as a publicity stunt. The Congress was deeply rattled by the Prime Minister’s sarcastic remark during his address in the Rajya Sabha when Renuka Chowdhury could be heard laughing hysterically. Since then, the Congress has attempted to portray it as an insult to the dignity of all Indian women. Haseeb Ahmed said, “It’s sad that the PM has shown disrespect to a woman MP in Rajya Sabha. Modi described the laughter of the woman MP in the context of the Ramayana and we have launched a Mahabharat against him and his team.” Haseeb also demanded that the Prime Minister apologize to the crores of Indian women, who according to him, have been insulted by Narendra Modi’s jibe. Earlier, posters depicting Rahul Gandhi as Lord Rama had also appeared. The winds of change which started blowing when Narendra Modi became the Prime Minister seems to have had a ‘Hinduizing’ effect on the Congress party, mostly only on the surface and not on its nature itself.